Que Pasa Mexican Foods Ltd.
A traditional Mexican flatbread. Chewy and bursting with flavour, this tortilla is made entirely with fresh, stone-ground, organically grown corn. This product traveled 15 km to reach our warehouse. 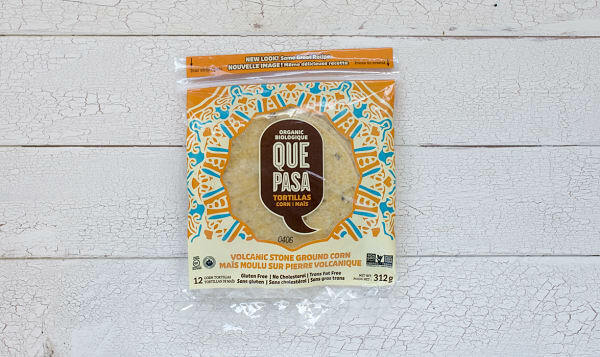 Que Pasa's goal is to produce healthy, natural products that satisfy everyone's cravings for the delicious tastes of Mexico and the Southwest. They stone grind certified organic corn with traditional lava stones for an authentic flavor and texture and they only use pure expeller pressed GMO free Canola oil. Que Pasa began as a store-front deli, in downtown Vancouver, that made fresh salsa and tortilla chips. Their success as a deli grew rapidly and by 1990 they had to move to a larger facility to accommodate the demand for their products. The new facility is equipped with equipment for cooking and stone grinding the organic corn, and also a large kitchen space for making the famous Que pasa fresh salsa and prepared meals. Que Pasa now supplies to most major supermarket chains, warehouse clubs, hotels, and restaurants. Que Pasa also produces private label products for several natural food companies. They have expanded their distribution across Canada and into the United States.